The announcement was made during a special award ceremony at Lancashire Police headquarters in Hutton on Thursday, March 21st. A panel of judges including the current High Sheriff, the Lancashire Partnership Against Crime (LANPAC); Russell Millhouse, Regional Projects Lead from the University of Central Lancashire and the former High Sheriff Rodney Swarbrick, who initiated the award, also selected a second and third place. Runner-up Patrick Maynard, 16 from Blackburn, was congratulated for his work in helping people living with dementia. Outside of school, he volunteers at EachStep dementia care home, dedicating his time to getting to know the residents and making them feel valued, especially those who do not have regular visitors. He is also a police cadet and has undertaken lots of fundraising activities to raise money for young carers. In third place was Pacey Bramwell, aged 16, from Blackpool. When Pacey was walking home from school recently she came across a man who had collapsed in the street with a suspected heart attack. She calmly rang emergency services while beginning first aid. When paramedics arrived they said Pacey had been successful in starting the man’s heart again. She is also the Vice Captain of her school, representing her fellow pupils at events and helping with anti-bullying issues. 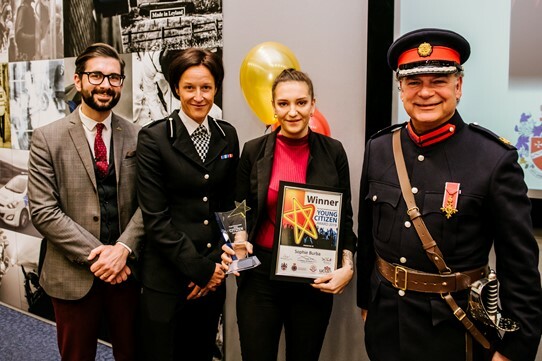 “This year it has been really inspiring to see so many examples of selflessness, initiative, determination and bravery from our young people across the county.